Theatre students and staff from Westmont, Del Mar, Leigh, Branham and Prospect High Schools came together for the 15th annual TheatreFest on Friday, January 25. The sold-out event featured several short acts performed by students from all the schools based on the theme “Transitions,” in which each scene led into the next one. 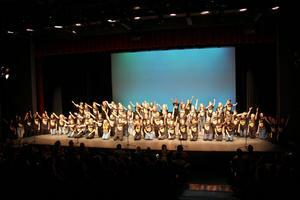 The performances consisted of 75 student performers and 30 technicians from all the schools involved. At the end of the night, each theatre teacher had the opportunity to honor specific students by handing out awards. “It's always a really great evening,” said Westmont High School parent Elizabeth Ward. You can stay up to date on all the CUHSD theatre productions by clicking here.